StarCraft II: Wings of Liberty Will Contain Protoss "Mini-Campaign"
An official blue poster on the Battle.net forums has revealed that the first StarCraft II chapter will contain a mini-campaign using Protoss units. Starcraft II will be released in three iterations, with each focusing on one of the three races: Terran, Zerg and Protoss. 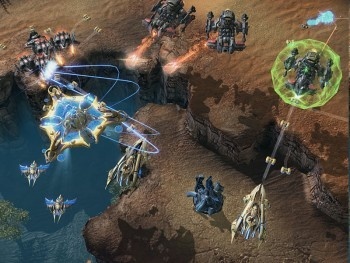 The first will be Wings of Liberty, which follows the Terran and is expected in Q1 or Q2 2010. The subsequent chapters are called Heart of the Swarm and Legacy of the Void which will focus on the Zerg and Protoss races respectively. Xordiah, an official Blizzard moderator on the Battle.net forums, said that while StarCraft II: Wings of Liberty is the Terran chapter, there will also be a Protoss section. The "mini-campaign" will be much shorter than the Terran missions, but will give the player a taste of the different units and playstyles that the race provides. Xordiah said, "I can confirm that there will be a Protoss mini-campaign that lets you control Protoss units. This part of the campaign mode is of course way shorter than the Terran part, but it is very fun to have a very different playstyle to add even more variety to the game. I am sure every Protoss fan will love this part of the Campaign!" You won't be using all units or getting to know buildings and upgrades. In general, even for Terran, it is not the objective of the singleplayer to show how to play the game effectively, it is to tell a story and do a lot of fun things, that would not be possible in multiplayer. The Challenges, mini-missions, that ask you to complete a very specific task, are more suited to give players the opportunity to learn how to use the units and how to play the game. I imagine that the Protoss mini-campaign might act like the Orc prologue in Warcraft 3: Reign of Chaos wherein the player controlled Thrall and learned the basics of how to control the game and the user interface.